Peptide (C)HVIDIDRGDEKKGKD, corresponding to amino acid residues 300-314 of rat AQP4 (Accession P47863). Intracellular, C-terminus. Homology Mouse - 14/15 amino acid residues identical; human - 13/15 amino acid residues identical. Standard quality control of each lot Western blot analysis (unlabeled antibody, #AQP-014), and immunohistochemical staining (labeled antibody). Immunohistochemical staining of Aquaporin 4 in rat and mouse brain free floating frozen sections using Anti-Aquaporin 4 (AQP4) (300-314)-ATTO-594 Antibody (#AQP-014-AR), (1:80). A. AQP4 staining (red) in rat hippocampal CA1 region appears in outlines of blood vessels (arrows). DAPI is used as the counterstain (blue) and stains the pyramidal layer (P). B. AQP4 staining (red) in mouse hippocampal dentate gyrus region appears also in outlines of blood vessels (arrows). DAPI is used as the counterstain (blue) and stains the granule layer (G). King, L.S. et al. (2004) Nat. Rev. Mol. Cell Biol. 5, 687. Manley, G.T. et al. (2004) Neuroscience. 129, 983. Lennon, V.A. et al. (2005) J. Exp. Med. 202, 473. Aquaporin 4 (AQP-4) belongs to a family of membrane proteins that allow passage of water and certain solutes through biological membranes. The family is composed of 13 members (AQP-0 to AQP-12). The aquaporins can be divided into two functional groups based on their permeability characteristics: the aquaporins that are only permeated by water and the aquaglyceroporins that are permeated by water and other small solutes such as glycerol. AQP-4 together with AQP-1, AQP-2 and AQP-5 belong to the first group1. Little is known about the function of the two newest members, AQP-11 and AQP-12. The proteins present a conserved structure of six transmembrane domains with intracellular N- and C-termini. The functional channel is a tetramer but each subunit has a separate pore and therefore the functional channel unit, contains four pores1. AQP-4 is the major membrane water channel in the central nervous system. The channel is expressed in astrocyte foot processes in direct contact with capillary vessels in the brain suggesting a role in water transport under normal and pathological conditions. Indeed, transgenic mice lacking AQP-4 have reduced brain swelling and improved neurological outcome following water intoxication and focal cerebral ischemia. In contrast, brain swelling and clinical outcome are worse in AQP-4-null mice in models of vasogenic (fluid leak) edema caused by freeze-injury and brain tumor, probably due to impaired AQP-4-dependent brain water clearance2. In addition, it has been recently shown that neuromyelitis optica (NMO), an inflammatory demyelinating disease that selectively affects optic nerves and spinal cord, is caused by the development of an autoantibody directed against AQP-43. Immuno-colocalization of Aquaporin 4 and TrkB in rat cerebellum.Immunohistochemical staining of perfusion-fixed frozen rat cerebellum sections using Anti-TrkB (extracellular)-ATTO-488 Antibody (#ANT-019-AG), (1:80) and Anti-Aquaporin 4 (AQP4) (300-314)-ATTO-594 Antibody (#AQP-014-AR), (1:80). 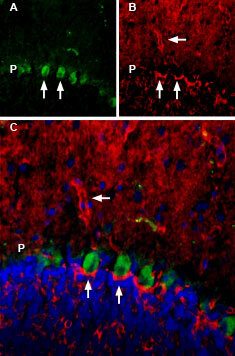 A. TrkB labeling (green) appears in Purkinje cells (arrows) forming the Purkinje layer (P). B. Aquaporin 4 staining (red) appears in outlines of the “baskets” formed around Purkinje cells (vertical arrows) and in some blood vessels (horizontal arrow). C. Merge of panels A and B demonstrates the localization of TrkB and Aquaporin 4 in adjacent cellular compartments of the cerebellum. Nuclei were demonstrated using DAPI as the counterstain (blue). Anti-Aquaporin 4 (AQP4) (300-314) Antibody (#AQP-014) is a highly specific antibody directed against an epitope of rat AQP4. The antibody can be used in western blot, immunohistochemistry, and immunocytochemistry applications. It has been designed to recognize the Aquaporin 4 channel from rat, mouse, and human samples. Anti-Aquaporin 4 (AQP4) (300-314)-ATTO-594 Antibody (#AQP-014-AR) is directly labeled with an ATTO-594 fluorescent dye. ATTO dyes are characterized by strong absorption (high extinction coefficient), high fluorescence quantum yield, and high photo-stability. The ATTO-594 fluorescent label belongs to the class of Rhodamine dyes and can be used with fluorescent equipment typically optimized to detect Texas Red and Alexa-594. Anti-Aquaporin 4 (AQP4) (300-314)-ATTO-594 Antibody is especially suited for experiments requiring simultaneous labeling of different markers. Anti-Aquaporin 4 (AQP4) (300-314) Antibody (#AQP-014), (for western blot analysis). Anti-Aquaporin 4 (AQP4) (249-323) Antibody (#AQP-004). This antibody recognizes a different epitope and thus can also be used as a control for detecting AQP-4.